ContentLens is the PUP that uses misleading techniques to prevent removal. Use Reimage to locate malicious components and get rid of them faster than with uninstall instructions. A full system scan blocks virus reappearance and prevents traffic to malicious domains. How can ContentLens hijack my computer? How to remove ContentLens virus? ContentLens is a legitimate tool that is supposed to locate the most beneficial sales, discounts, coupons, etc. and display them while users open online shopping websites. However, we can firmly assert that all programs that are somehow related to ‘deals’, ‘discounts’ ‘sales’ etc. and claim being able to save time and money while shopping online are usually categorized as adwares and potentially unwanted programs (PUPs). ContentLens is not an exception. 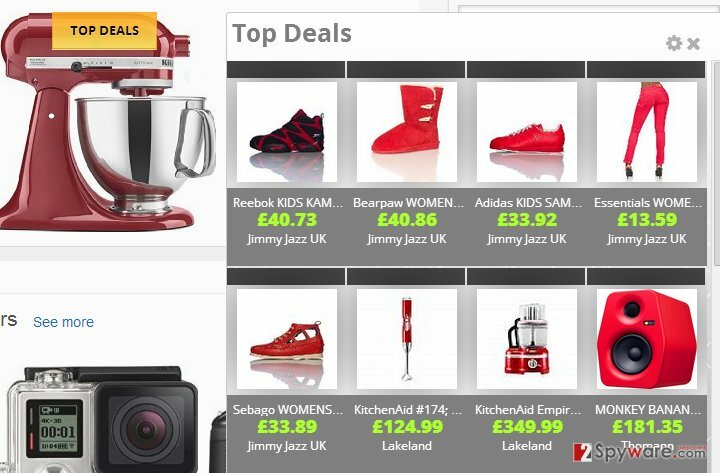 It’s very similar to such widely spread adwares as UniDeals, Shoppi, Deals Finder, CoolincCheap and many others. All of them are unpopular for displaying an excessive amount of potentially dangerous advertisements during browsing, redirects to suspicious-looking websites, tracking software and other issues. ContentLens virus is also aimed at increasing page rank for affiliate websites and generating revenue for third-parties. For that, this ad-supported extension may deliver a ton of sponsored advertisements marked as ‘Ads by ContentLens’ and link them to predetermined websites. It goes without saying that there are lots of unfair parties who may try to spread other potentially unwanted or even malicious programs. Consequently, ContentLens redirects may expose your computer to contaminated websites where you may even end up with virus or malware infiltration. Besides, once inside, this adware may start collecting your browsing history and track your activities on the Internet. It’s mainly targeted at personally non-identifiable information, such as search terms, websites visited, clicks, data entered in certain websites and so on. In most of the cases, such information is used for marketing purposes. However, can anyone guarantee that sensitive information won’t be collected as well and misused for deceiving you? Probably not. Therefore, we highly recommend you to remove ContentLens virus from your computer ASAP. The most reliable way to eliminate such and similar programs is to run a full system scan with a reliable anti-spyware, such as Reimage. Here, look for ContentLens or any other recently installed suspicious programs. Wait until you see Applications folder and look for ContentLens or any other suspicious programs on it. Now right click on every of such entries and select Move to Trash. When in the new window, check Delete personal settings and select Reset again to complete ContentLens removal. Once these steps are finished, ContentLens should be removed from your Microsoft Edge browser. Here, select ContentLens and other questionable plugins. Click Remove to delete these entries. Now you will see Reset Firefox to its default state message with Reset Firefox button. Click this button for several times and complete ContentLens removal. Here, select ContentLens and other malicious plugins and select trash icon to delete these entries. Click Reset to confirm this action and complete ContentLens removal. Here, select Extensions and look for ContentLens or other suspicious entries. Click on the Uninstall button to get rid each of them. Now you will see a detailed dialog window filled with reset options. All of those options are usually checked, but you can specify which of them you want to reset. Click the Reset button to complete ContentLens removal process. This entry was posted on 2015-03-09 at 03:57 and is filed under Adware, Viruses. You can quickly scan the QR code with your mobile device and have ContentLens manual removal instructions right in your pocket. How did you remove ContentLens?